Jobst Brandt is all smiles as he nears the summit on the New Idria ride in 2003. With April just around the corner my thoughts turn to the New Idria ride, which I started doing in 2003 with Jobst Brandt and friends. 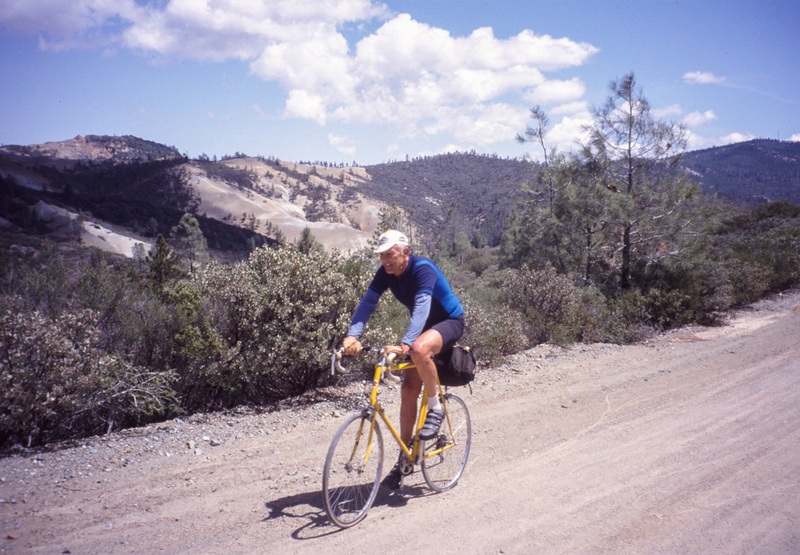 Bruce Hildenbrand, no stranger to adventure rides, turned me on to the 115-mile route through the wilds of San Benito County. I was young and strong enough back then to finish the ride before dark. Jobst, despite being 68 years old, had no difficulties making the arduous trek that included a climb on a gnarly dirt road to 4,450 feet altitude. Where Jobst got his strength is a mystery, but his massive legs could power his 185-pound frame up the steepest roads, including three-week rides in the Alps. Memories are all that’s left for me. I’ve lost so much leg strength that a ride of such rigor would be impossible. It happens to everyone, eventually. It happened to Jobst on a foggy morning in January 2011. The effort of a ride to Santa Cruz and home — 120 miles — was his idea of a fun day. He crashed early in the ride, his body and mind unable to cope with the demands. I often thought about just when and how I would accept old age. It’s not an easy thing, accepting that your mind is willing, but your body is not. In 2017, after riding 118 miles on the Mt. Hamilton loop, I decided I had had enough. It wasn’t fun anymore. My body ached in so many places I can’t name them all. It wasn’t for lack of fitness. It was just old age. Unlike Jobst, who often said he would continue doing the same rides until the bitter end, I decided to ride fewer miles. A hit and run accident in 2018 told me that not only was I getting old, the odds were running against me, like the front-line soldier who wonders when the bullet with his name on it will find him. Now when I go for a ride, I think about the distance and traffic. With a little planning I can cover most of the routes I used to do, after a drive to Skyline Boulevard, a bus or train ride. New Idria I miss you. But a shorter ride from Paicines to Panoche Valley and back…wouldn’t that be nice. This entry was posted on March 25, 2019 at 1:43 pm and is filed under History. You can follow any responses to this entry through the RSS 2.0 feed. You can leave a response, or trackback from your own site. Boy, I sure can identify with these sentiments – especially about the increasing odds of getting into an “incident” with a motor vehicle. Despite all the efforts of cities to make cycling a bit safer, these efforts are being overwhelmed by a deterioration in driver attitude, attentiveness, education and patience. Inspired by your ride report I rode with some other riders from Paicines to New Idria on Saturday, via Old Hernandez and Coalinga Rds, and back via Panoche Rd. Clear Creek was muddy but rideable; the creek crossings helped clean the mud. The descent into New Idria was deep, churned, peanut butter like mud. Wheels were jammed and it was hard to even walk and roll the bike, calling for frequent stops to clear mud. There is still rain in the forecast. It is a good idea to not ride to Idria via Clear Creek for a few weeks at least. I can’t say much for old age. I can however say that you have had more adventures, and inspired many others’, than most able cyclists have in a lifetime. Sourav…wow, these are great photos. Brings back memories to my ride of New Idria in March 2015. We are fortunate these days to have an option to extend riding beyond our abilities: get an e-bike. Are you not considering this, Ray?